It is always exciting when the St. 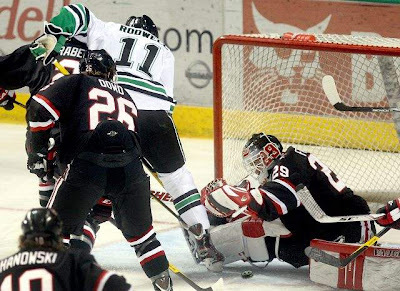 Cloud State Huskies take on rival the UND Sioux. The Husky fan base got a big surprise Friday afternoon when we learned that #1 goalie Mike Lee did not make the trip to Grand Forks and is “for sure, out a couple of weeks” with an injury. Instead freshmen goaltender Ryan Faragher, who had previously only played one collegiate game and had not yet played in the WCHA, would be between the pipes against perennial hockey powerhouse UND. Faragher did not disappoint in his WCHA opener stopping all 44 UND shots, earning a shutout, on the way to a 4-0 Husky victory. The Huskies were badly outshot, but that was largely due to the fact the Huskies spent a good part of the night on the penalty kill. Although it is great the Huskies were able to kill the penalties Friday night, they will need to be more disciplined as the penalties could cost the Huskies games in the future (see Saturday night's game). The goal scorers for the Friday's game included: Jared Festler, Andrew Prochno, Sam Zabkowicz, Travis Novak. Unfortunately, the Huskies were not able to pull out the same impressive win on Saturday night. In the end it was the penalties that cost the Huskies the game as the Sioux scored 2 powerplay goals going 2-for-4 on the night. The Huskies showed a lot of strength in the third period by outshooting North Dakota by an impressive 12-6 margin. The lone goal scorer for the Huskies was Ben Hanowski. Freshman goalie Ryan Faragher had another very good night with 23 saves in the loss for SCSU. The SCSU Huskies will return to the National Hockey Center on Friday, Nov. 4 (7:37 PM) and Saturday, Nov. 5 (7:07 PM) for games against the University of Wisconsin Badgers. The games will be televised live on Charter Cable Channel 87 in the St. Cloud area. The game on Nov. 5 will be televised live in the Twin Cities on Comcast Cable (channel 13 in St. Paul/channel 23 in Minneapolis). Wisconsin is coming off a split with UNO. Outplayed? I disagree. Neither team was dominant in any fashion this past weekend, with the glaring exception of Mr. Faragher's impressive performance on Friday. Yes the Dogs took some poor penalties which cost them, but did they outplay the Green & White? Nada. Thanks for all of the updates and videos. I enjoy your blog. @Arleigh- Yeah, I am sticking with the Huskies outplaying the Sioux (not saying they "dominated" the Sioux, but yes..outplayed them). Particularly on Friday night when Freshman Faragher got the shut out. The team was also impressively able to kill 7 penalties (thus spending a great chunk of the night on the PK). Yes, the Sioux put up an impressive amount of shots on goal, but nearly half came while on the PP. I think the Huskies looked good Saturday night too, but the unfortunate (stupid) penalties caught up to the Huskies and therefore lost the game. @Anonymous- Thanks for the complements. Glad to hear you enjoy! Go Huskies!